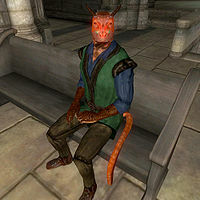 Beem-Kiurz is an Argonian healer added as a replacement for Marz by the Knights of the Nine official plug-in. His schedule and services are nearly identical to those of Marz. In particular, he offers advanced training in Restoration at the Great Chapel of Mara in Bravil. He wears a blue & green outfit and a pair of quilted shoes. He carries the Bravil Chapel key and a small amount of gold. Beem-Kiurz knows a leveled set of healer spells, as well as one extra major Restoration spell. From 10am to 12pm and 4pm to 8pm every day he can always be found in the chapel worshipping and will provide training services. It is also possible to get training from him between 12pm and 4pm, but he is likely to be in the sanctuary or undercroft during those time periods and therefore difficult to access. Beem-Kiurz does not provide the reference necessary to start Restoration Master Training with Oleta.